Club Dada owners Josh Florence, Phil Coward, Bryan Austin, and Tim Daniels opened up this new joint next to their original baby. 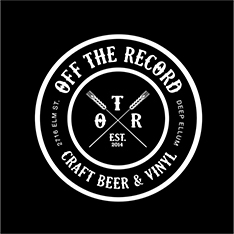 Part bar, part music venue, Off the Record offers 24 craft and local beers on tap, a small menu of craft cocktails, vinyl racks with more than 2,000 records selected by Good Records, and a covered outdoor patio and deck. The grand opening is slated for Sep. 12.